Some of the earliest roadways through Amherst may have started as Indian paths. The Proprietors of Hadley set out roads or tracks for Hadley residents to access the woodlands and hunting grounds of Amherst. Many of the earliest “ways” were recorded in the survey for the land divisions of 1703. In Massachusetts law, these are not public ways just because a pathway was cleared; the district or town had to have taken formal action regarding them in town meetings. Another old method to create public ways was by dedication, a routine often used in the early part of the 19th century. By a series of deeds, the landowners could create public easements across their property. Property owners could then take advantage of passing traffic by establishing shops and business along the road. Some of the streets in Amherst were so dedicated, one being North Prospect Street. Many early town streets have been adjusted or “improved” through the years. The Hampshire County layouts of public ways often left the older underlying town ways intact. For instance, Potwine Lane (a road near South Amherst) was narrowed to 4 rods (66 feet) by the town meeting in 1788. In 1884 a county layout was established over the same highway with a width of 33 feet. 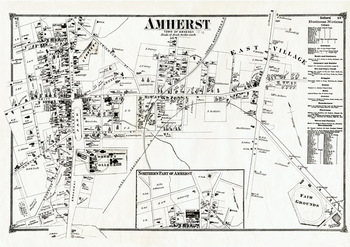 Find extensive detail on the history of many individual streets and neighborhoods in the Town of Amherst's GIS website.